Could this be billed as Mission Impossible? A man-made vortex that is 200 meters in diameter and goes up 10 kilometers into the air? Not according to a retired engineer from ExxonMobil. The idea is to create a huge vortex of warm air to cause a change in pressure at the bottom in order to drive a turbine-generator. An idea derived from the tornado formation. The concept of creating a vortex with Atmospheric Vortex Design. Illustration by vortexengine. 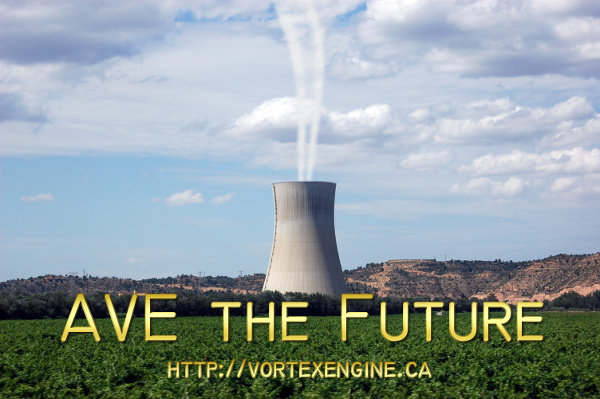 Fossil fuel power plants generate ample waste heat that can be used to make more electricity. The idea is unusual, and for 35 years Louis Michaud, a retired engineer from ExxonMobil, has mulled over how to bring the concept into reality. Michaud just got some backing, and it’s coming from a prominent Silicon Valley technology investor. A foundation by Peter Thiel, who co-founded PayPal, just awarded Michaud a $300,000 grant to show that his idea could work, said Michaud from his home in the Canadian province of Ontario. “I think there is a huge potential here, and I don’t want to let it go,” Michaud said. The money will allow Michaud to experiment with and document the creation of a mini vortex for electricity generation at the Lambton College in the city of Sarnia. The college, located in an oil drilling region, has the proper lab equipment for his project. The concept for creating a vortex, like a tornado, is based on the fact that air, when heated, will expand, become lighter and rise up. As the air rotates and goes up, the pressure at the bottom of the vortex becomes lower. As surrounding air enters at the bottom, and the difference in pressures then drives a turbine generator to produce electricity. The diameter and height of the vortex make a difference in how much energy can be produced. A vortex that is 200 meters in diameter and goes up 10 kilometers into the air could have the production capacity of 200 MW, Michaud said. He envisions power plant owners to set up vortex-building equipment at existing facilities to make use of the waste heat and increase the overall electricity-production efficiency of the power plant. There already are technologies that exist today to harness waste heat at power plants. A combined-cycle natural gas power plant takes the heat byproduct from burning natural gas and makes steam to run a turbine generator. Doing so increases the efficiency of a power plant from the 40 percent range (simple-cycle design) to just over 60 percent (combined-cycle design). Michaud claims that his vortex station could make use of the waste heat a second time and boost the efficiency by another 20 percentage points. For his prototype project, he plans to build a much smaller one that goes up 15 meters into the air and shows how it could turn a turbine. Michaud hopes to produce enough results to prove the technology concept by the end of the summer of 2013. If he can demonstrate the idea’s feasibility, then he will eventually need some willing power plant owners to give him a chance for a field demonstration. To make this happen will be especially difficult because power plant owners aren’t known to take technology risks. For one thing, they have to abide by a host of regulations, including safety rules, and often under law they could get penalized for not maintaining a reliable supply of electricity. Trying out new equipment could throw their energy production out of whack. Kaedah ini masih diperdebatkan kerana dikhuatiri memberi risiko kepada keseimbangan tekanan udara yg selanjutnya mewujudkan pembentukan tornado berbahaya. Tunggu dan lihat bagaimana prototaip pertama berfungsi nanti.